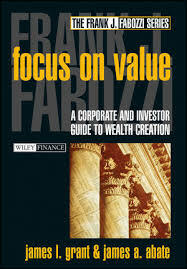 245 1 0 %a Focus on value : %b a corporate and investor guide to wealth creation / %c James L. Grant, James A. Abate. 260 %a New York : %b John Wiley & Sons, %c cop. 2001. 300 %a VI, 192 s. : %b il. ; %c 24 cm.